As part of the strict community service sentence given to me after my little “incident” at the public park, I promised JGR I’d deliver reviews for the entire Disney/Capcom/Duck trilogy (see my reviews of Darkwing Duck and DuckTales. With that in mind, I bring you the final installment: DuckTales 2. If you don’t remember Disney’s 1980’s Saturday morning duck-themed TV blitzkrieg, then go look at those previous reviews because I’m tired of explaining it. 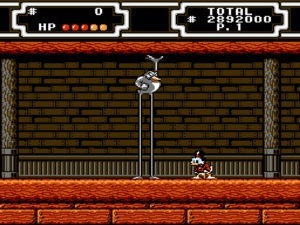 DuckTales 2 marks the return of the previous game’s main characters that fans will remember fondly from the show. This time around, Scrooge’s li’l nephews have stumbled upon an old treasure map that reveals the location of a nifty keen hidden treasure. Again choosing to senselessly endanger his family’s lives, the incredibly wealthy Scrooge embarks upon the quest for more surplus riches! Yeah, it’s pretty silly that the “richest duck in the world” has starred in two videogames wherein the main goal was to get MORE money, but I guess an adventure where he found true love and inner peace would have been kinda boring. The classic theme song is here once again, and so is Scrooge’s mysterious winking eye at the title screen. 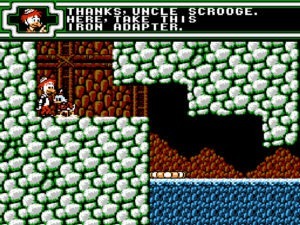 After choosing one of three difficulty levels, the player is taken to a map and questioned by sidekick Launchpad as to which one of five treasure-laden locations Scrooge should visit first. Niagara, Scotland, the island of Mu, Egypt, and Bermuda are all available for your gold-diggin’ enjoyment, and according to the map, they’re all conveniently located in the same 3 mile radius. I recommend the WWII island-hopping strategy. 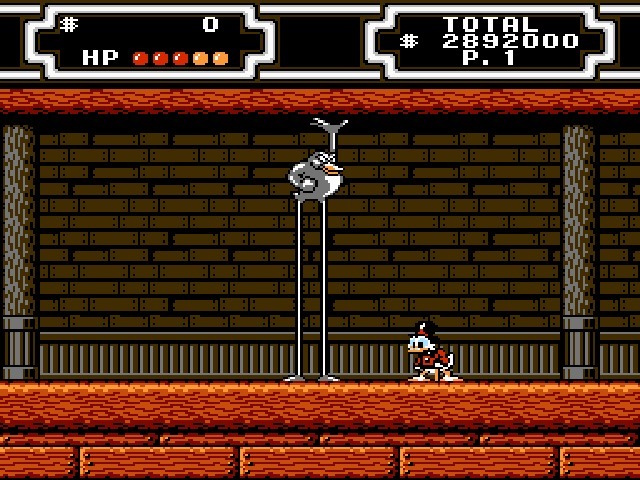 Players of the two previous games will note that Launchpad acts not only as a guide, as he did in Darkwing Duck, but as a safe point within levels, as he did in DuckTales 1. Nice combo. 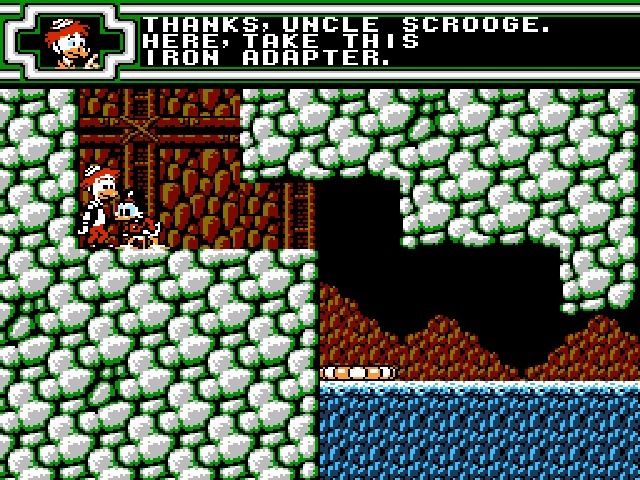 In the actual levels, Scrooge plays pretty much as he did in the first game, but with one important difference. Now, one only needs to hold the A and B buttons to perform the pogo-cane attack. In the previous title, the down arrow was also part of the process. Apparently I wasn’t the only one who was annoyed at having to figure out three different buttons without a manual. Kudos to Capcom for correcting this. Similarly, you can now whack things with your cane while in mid-air, and even pull things with it once you’ve collected a special gadget from Gyro, the inventor. Uh, Gyro, you don't have to give me whatever's in your pockets everytime we meet. Speaking of Gyro, the occasional cameo character shows up to help you and give you advice along the way. Huey, Dewey, and Louie are much more important in the sequel than in Scrooge’s first outing. Their obvious suggestions have been replaced by puzzle-solving clues. That’s right. Puzzle-solving. Sure, they’re all no-brainers (this is a kid’s game after all), but the occasional series of levers and hidden passages are a welcome change from D1, where the only challenge was the fabled “Dear-Lord-Stop-Sending-Me-Back-To-Transylvania” puzzle. End of the level bosses are also more of a challenge. You may have to actually pay attention to patterns of movement and develop a strategy this time around. Power-ups are exactly the same as in D1, although they are less readily available. One notable addition to the system is an item shop you can visit after each level where you can buy life-giving cakes, safes to protect your money, good “mojo” (eww…), and even a piece of the treasure map. It’s all pretty neat. Capcom actually took some time to try to improve a game that could have been a cheap clone of its predecessor. But, even with these additions, D2 just isn’t as cool as D1. The levels in D2 are richer than D1, offering the puzzle-solving as well as the multi-tiered vine climbing, and yet D2’s stages aren’t as interesting. Everything in D2 seems more complicated but less engaging. One reason might be that most of D2 is a drab brown, while D1 offered lots of color. Or perhaps the human body just doesn’t need TWO DuckTales games. For whatever reason, I found myself skipping puzzles out of disinterest (though I still beat the game, more on that below). Don’t get me wrong; it’s a good game, just not great. Despite the new elements, that intangible “grab-your-interest factor” seems absent. Anyway, at the game’s climax, we learn that the evil Flintheart Glomgold has kidnapped Webby!! 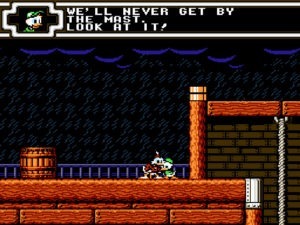 Scrooge is forced to meet Glomgold back at the pirate level (mercifully an enemy-less shortened version of the level, unlike Transylvania in D1) and trade all his treasure for Webby. But of course, Glommy double-crosses him and…well…I don’t really know how to put this… He brings out a cyborg. Yes, as Arnold would say “likvid meduhl”. In fact the thing is even called the “D-1000” as a clever reference. Cute…but damn weird… As if that weren’t exciting enough, DuckTales 2 actually has two endings! There’s something you wouldn’t expect from a Disney kiddy game. If Scrooge beats all of the level bosses but doesn’t find all of the map pieces, the player sees the first ending: Scrooge and the boys narrowly defeat Glomgold, and get to keep the cash they’ve collected, but they never find the big mama treasure they were searching for. This a real drag, because they don’t even tell you to play again for a different outcome, so you’re left wondering if the game was just leading you on all this time. If, however, you solve all of the puzzles and collect all the pieces, a new area called “Underground” appears on the map. Beat this level and you get the second ending wherein you discover the wondrous, magical secret of the game, which I can’t tell you because I didn’t really bother to do that. Hey, as I said, not that engaging. And of course, in the third ending, Meryl dies and Snake marries Otacon. Capcom fixed the controls for us, and threw in the item shop, multiple endings, and a proper pre-title intro sequence. And best of all: NO TRANSYLVANIA!! Bless me bagpipes! I swear this isn’t a bad game, but it just won’t hold your attention like the first one did.